Tribune News Service Take steps now to do a winter recovery on your home before spring arrives with new chores to tackle. Though spring is still a few weeks away, there are important tasks you can do around the house this month to prepare your home for the coming season. “It's vital to start on your winter-recovery checklist as soon as you start to feel the first shy breezes of spring blow in,” says Rob Morelli, chief executive of HomeKeepr.com, a referral network for home-service professionals. Seal air leaks. The dead of winter is when you'll really notice drafts in your home. This will make it easier for you to identify air leaks and plug them, which will help prevent warm air loss now and cool air loss during warm spring days, Morelli says. Clear out gutters. Heavy snow or ice can loosen fasteners and pull gutters away from your home, says Morelli, which may cause drainage issues. “With the heavy rain months approaching and winter getting behind us, you want to fix any damage to gutters now,” he says. Clearing gutters of winter debris will also prepare them for spring showers. Check for uninvited guests. Morelli says now is a good time to check certain areas of your home for animals or critters that may have taken up residence inside your house to escape the cold. Search for pests in dryer vents, the attic and the basement; animals tend to hole up in warm spaces. Test your sump pump. Sump pumps help keep basements and crawl spaces dry. If water accumulates in these areas, a sump pump will perform like a drain, sucking up the water and pumping it through a pipe that releases the water outside your home. Without a working sump pump, your home could be at risk of flooding, which is a real concern during spring showers, Morelli says. Prepare lawn equipment. If you've got a lawn to mow, tend to your equipment now so you're ready to kick off the spring season without a hitch. You can start by draining old gas and oil from your mower, because lawn mower fuel that has been left to sit over the winter can deteriorate and harm small engines, says Missy Henriksen, a spokeswoman at the National Association of Landscape Professionals. Then check your mower blades for wear and tear, replace spark plugs to ensure easy start-up, and inspect the air filter. A clogged or dirty air filter can cause the machine to burn gas less efficiently. Insulate the attic. If your attic has little or no insulation, the room could become a sweatbox on a warm spring day. Adding insulation before warmer weather arrives will prevent that from happening. Another benefit of insulating your attic now: It will help reduce heat loss during the cold winter days ahead, says Clement. Insulate pipes. 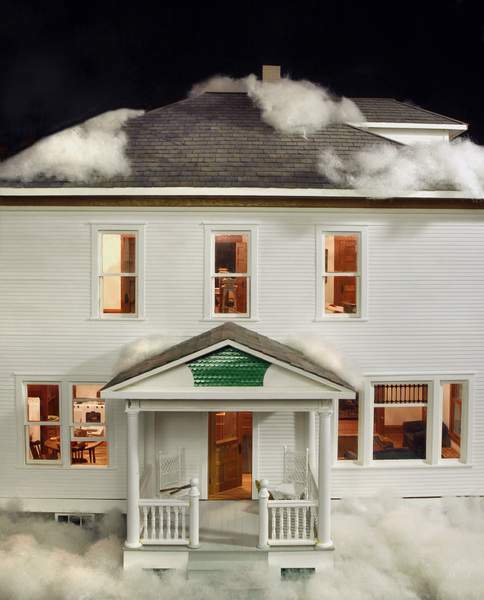 If a pipe burst in your house during a recent cold snap, make sure the new one is well-insulated. The last thing you want is for newly replaced pipes to burst. Check your deck. If you cleaned and sealed your deck in the fall, you're probably not going to need to worry much about damage. But if you didn't, check carefully for signs of rot before power washing the deck boards to remove the salt and muck from winter.